Wahama seniors Madison VanMeter (10) and Elizabeth Mullins (25) both leap for a block attempt during Game 1 of Tuesday night’s Class A Region IV, Section 1 volleyball match against Calhoun County at Parkersburg Catholic High School. 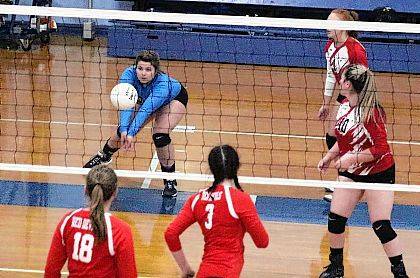 Wahama freshman Emma Gibbs blocks a dink attempt during Game 1 of Tuesday night’s Class A Region IV, Section 1 volleyball match against Calhoun County at Parkersburg Catholic High School. PARKERSBURG, W.Va. — It’s hard to be at your best with bullet holes in your shoes. 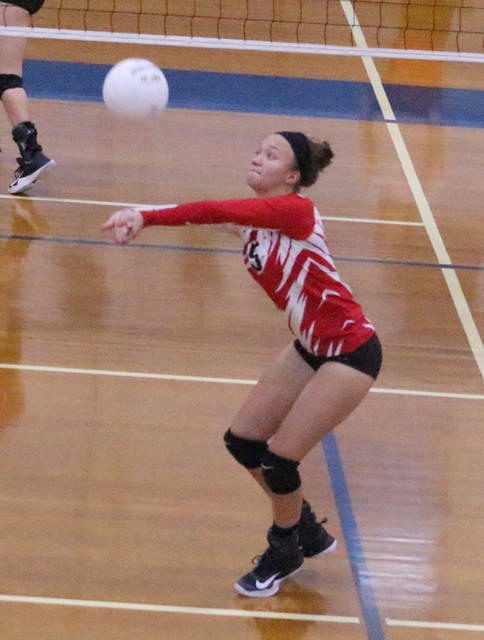 The Wahama volleyball team shot itself in the foot on more than one occasion Tuesday night, which ultimately allowed Calhoun County to claim a 25-13, 25-21, 25-22 victory in the loser’s bracket of the Class A Region IV, Section 1 tournament held at Parkersburg Catholic High School in Wood County. 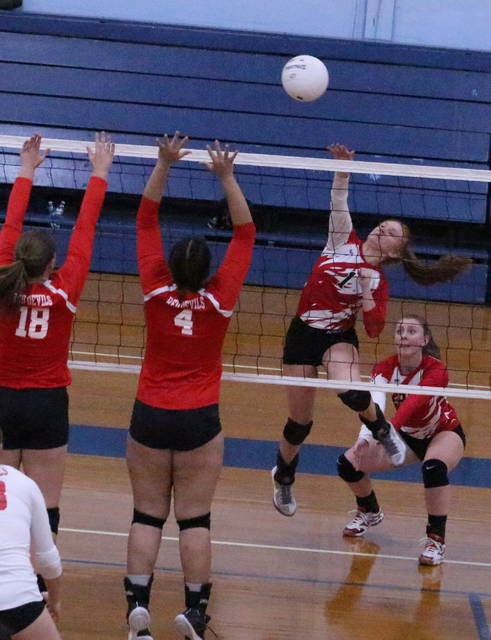 The Lady Falcons (5-22) battled through 12 ties and 10 lead changes throughout the course of the match, but fundamental breakdowns continually popped up in each set — which opened the door for the Lady Red Devils (17-15-1) to sneak away with a straight-game decision. Wahama led 1-0 in all three games, but the Red and White mustered only one lead larger than two points over the course of the night. CCHS, conversely, led the first and final games by double digits and also rallied back from a six-point deficit in Game 2. The Lady Falcons battled through four ties and four lead changes in the opening bout, but Calhoun County broke away from a 7-all tie by scoring 11 of the next 13 points en route to an 18-9 advantage — with a handful of those points coming from either defensive lapses or spike attempts in the net on behalf of WHS. 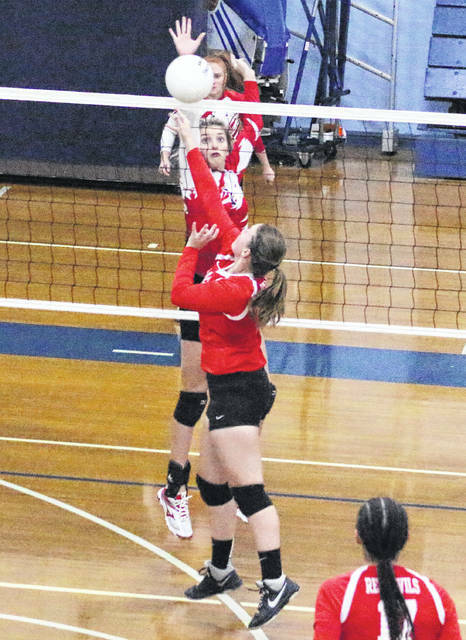 Wahama was never closer than eight points the rest of Game 1, which the Lady Red Devils claimed by a 12-point margin — their largest lead of the match. There were six ties and four lead changes in Game 2, with the Lady Falcons establishing their largest lead of the night at 13-7 midway in. Mistakes again popped up, and CCHS made a 15-4 run that turned Wahama’s six-point lead into a 22-17 deficit. WHS closed the middle game with a small 4-3 run, but was never closer than three points as Calhoun County claimed a four-point win for a 2-0 match advantage. Wahama’s only leads in Game 3 came at 1-0 and 2-1, then CCHS made a 10-3 charge to establish an 11-5 cushion. The lead grew to as much as 22-12 before the Lady Falcons made one last push to force a Game 4. 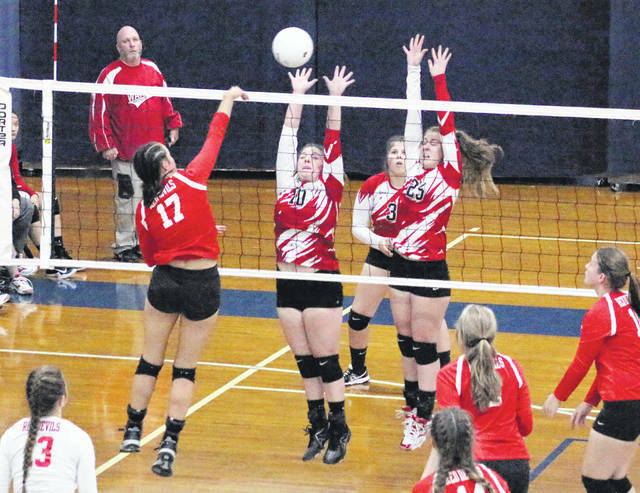 WHS whittled the lead down to 22-16 and was as close as 24-22 before the Lady Red Devils secured the final point to complete the straight-game triumph. Following the match, WHS coach Matt VanMeter couldn’t help but wonder how things could have turned out with a more-fundamental effort from his troops. Then again, it is the postseason … and this is a collectively young unit. Wahama more than doubled its win total from a year ago and earned a pair of season sweeps over Hannan and Belpre. The Lady Falcons also posted three victories in TVC Hocking play this fall, more than the previous two seasons combined. As WHS completes its eighth season with volleyball as a varsity sport, VanMeter feels that his three seniors — Madison VanMeter, Elizabeth Mullins and Destiny Sayre — should take a real pride in what they’ve accomplished over their careers. Harley Roush led the WHS service attack with nine points, followed by Hannah Billups with eight points and Gracie VanMeter with five points. Madison VanMeter and Makinley Bumgarner were next with two points apiece, while Mullins rounded out the scoring with one point. Madison VanMeter led the Lady Falcons with six kills, followed by Emma Gibbs with three kills and Billups with two kills. Roush and Mullins also had a kill apiece. Mullins and Gibbs each posted eight blocks in the setback. The Lady Falcons finished eighth in TVC Hocking play with a 3-13 league mark. ^Bryan Walters can be reached at 740-446-2342, ext. 2101.